Butterfly Reflections, Ink. 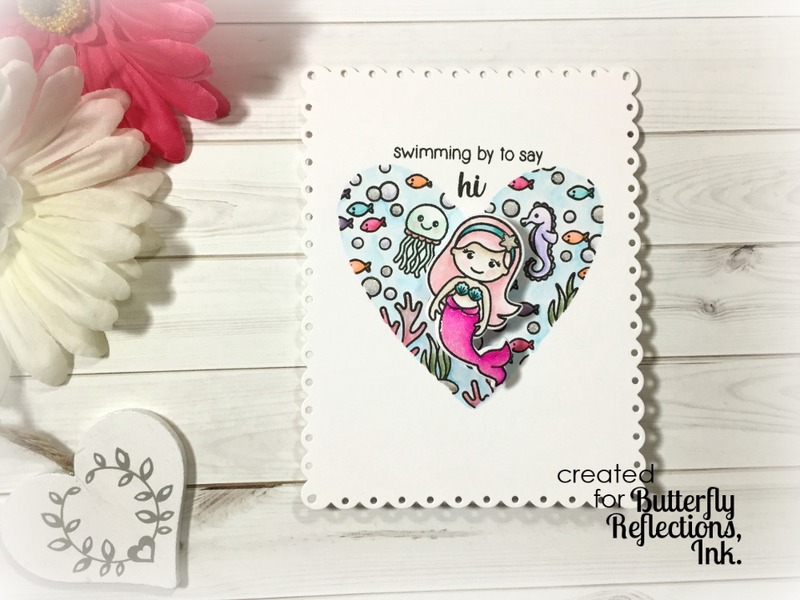 : Swimming By with Sunny Studio Stamps! Swimming By with Sunny Studio Stamps! Hey friends!! I'm so happy to be joining the BRI blog today!! 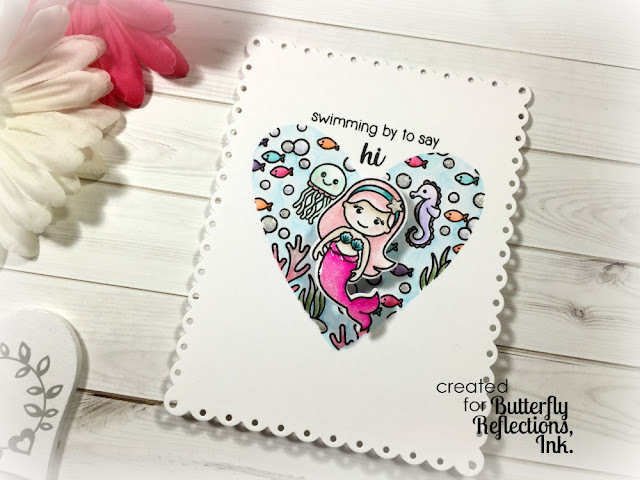 I have a super fun card to share with you today so let's dive right in shall we?? 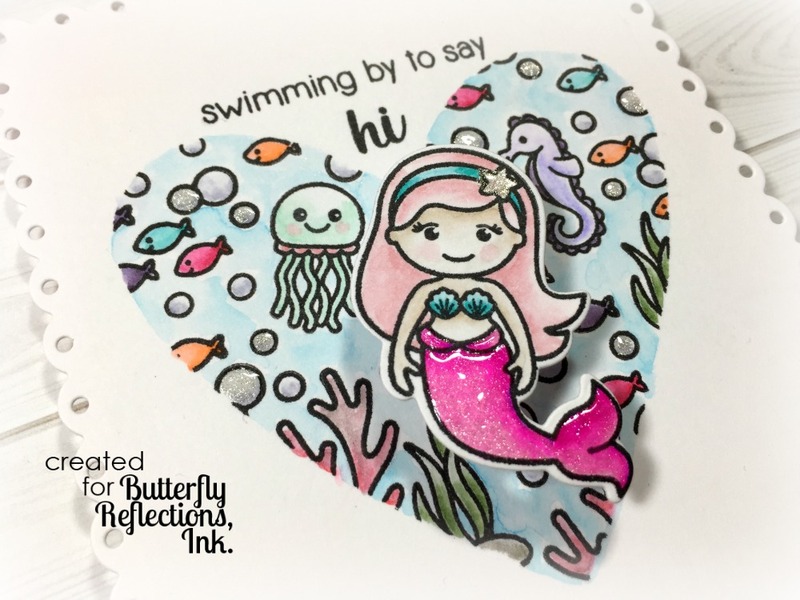 One of my all time favourite stamp sets from Sunny Studio Stamps is the Magical Mermaids set. Out of all the mermaid themed sets out there, I think this one is the cutest. I stepped a little out of my comfort zone for this one and tried this masking technique for the first time. 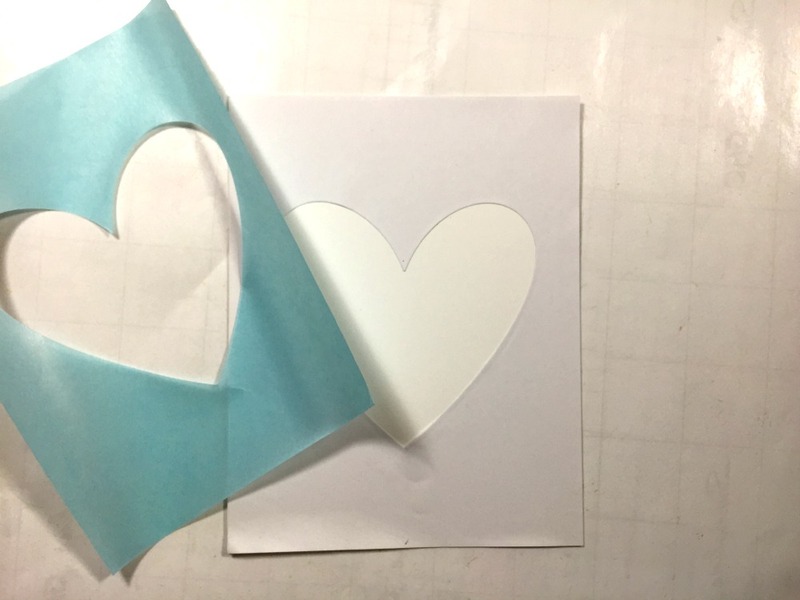 I started by cutting a heart mask using a sheet of Inkadinkadoo Stamping Mask Paper which was cut down to the size of an A2 card front and a heart die from Lawn Fawn. 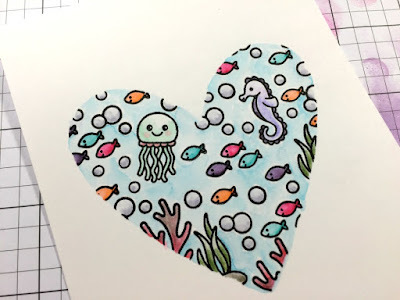 I chose Bristol Smooth cardstock as I knew I wanted to do some watercoloring. 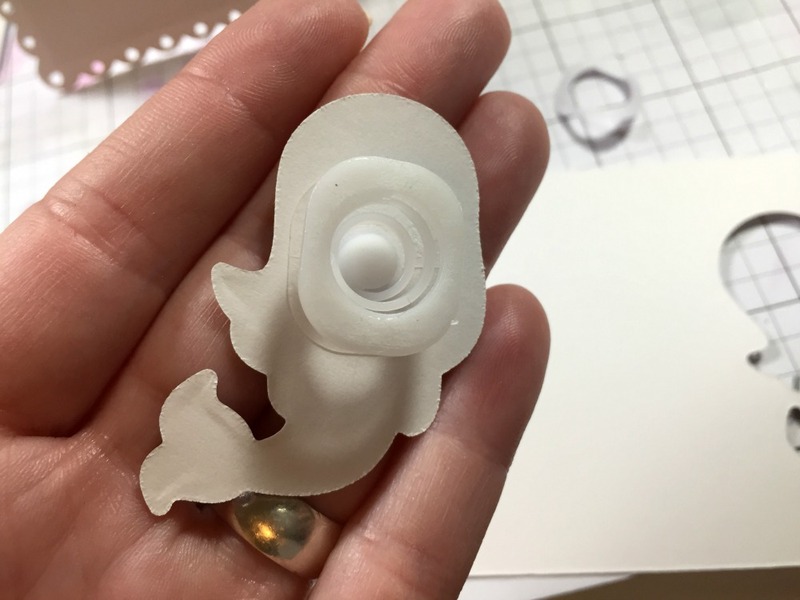 I chose a bunch of the smaller images in the stamp set to fill the inside of the mask making sure to stamp over the edge of the mask. This is what I ended up with.. I chose a handful of colours from my set of Tombow markers to colour in the images first. I then filled in and around each image with a blue marker. Turned out pretty good except for the slightly ugly coral at the bottom. I tried to mute a very bright pink colour by adding grey which obviously didn't work. But I went with it. There was no way I was starting over :)! 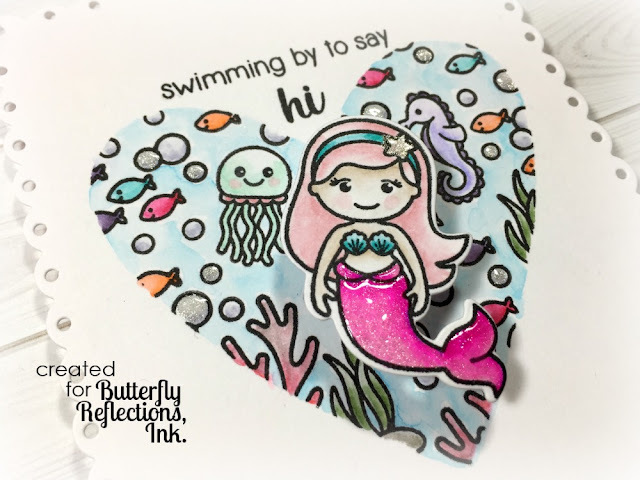 I stamped one of the mermaids on to Bristol paper as well and coloured her with the same markers. I used the co-ordinating dies to cut her out. For a bit of fun, I decided to add a Mini Wobble Spring to the back of her. To add a bit of interest to this panel, I used the largest of the Fancy Scalloped Rectangle Stackables to cut it down. I then made my own cardbase by cutting two pieces of cardstock with a rectangle die, scored one of them at the top at 1/2" and adhered them together with some Scor-Tape. I adhered the scalloped panel on top and voila!! Of course, the sentiment was the last thing on my mind but thankfully I remembered to stamp it before I attached the mermaid! 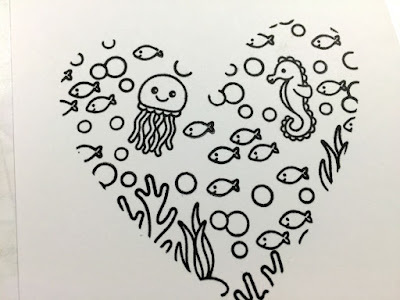 And you can't have an underwater scene with out some glitter and Glossy Accents!!! Thanks so much for stopping by today!! I hope you find some crafty time today! !